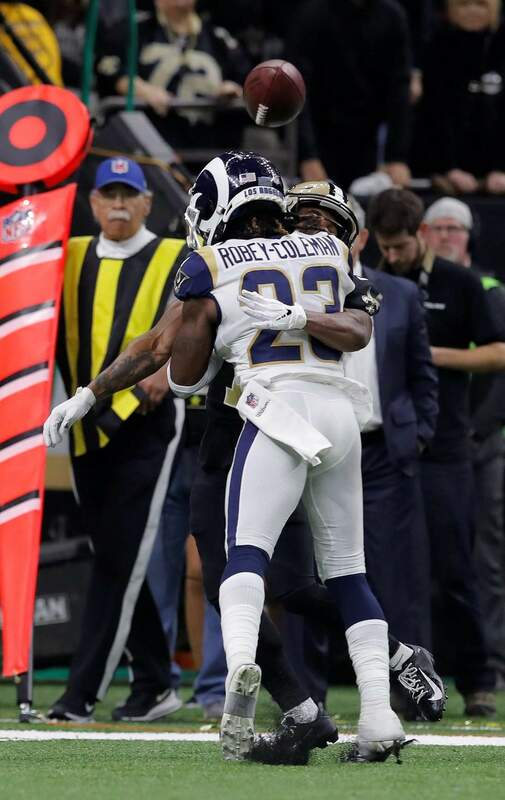 Los Angeles Rams defensive back Nickell Robey-Coleman defends against New Orleans Saints wide receiver Tommylee Lewis during the fourth quarter of Sunday’s NFC championship game in New Orleans. The Rams won 26-23, and the lack of a penalty on the play helped send the game to overtime. NEW YORK – Two people with direct knowledge of the NFL’s plans tell The Associated Press that the league’s competition committee will consider expanding replay reviews to include certain penalties, including pass interference. The people, who spoke Tuesday on condition of anonymity because the NFL has not publicly announced such plans, stressed that the committee looks into the parameters of replay yearly. It has considered inclusion of what are considered judgment calls by officials in the past.